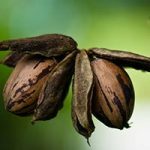 The pecan is a large North American tree which needs a fertile soil and sunny position. Nuts are delicious, acorn-shaped. Also edible is the sap, tapped liked maples. The timber is hard and used for fuel, handles, ladders, implements, and for smoking meats. A yellow dye is obtained from the bark. Hardy to -20°C. The mother trees fruit in Southern Canada and have good potential in Britain. These seedlings will not be identical to the parent but will inherit many of the characteristics. Two or more trees are needed for good nut production. Trees are grown in deep cells – pecans hate transplanting and are best planted as small container grown trees.